Nature in all its unspoiled glory has played muse to many artists through the years, but the ever-increasing ways we’ve sullied the earth have, themselves, offered new inspiration for eco-conscious creative types. John Sabraw, an artist and professor at Ohio University, was checking out some abandoned coal mines in his home state during a sustainability immersion course and was struck by strange gradients in the runoff. “They’re a little clear right at the beginning, then the whole rest of the stream is just yellow once the suspended metals begin to oxidize," he explained to me. 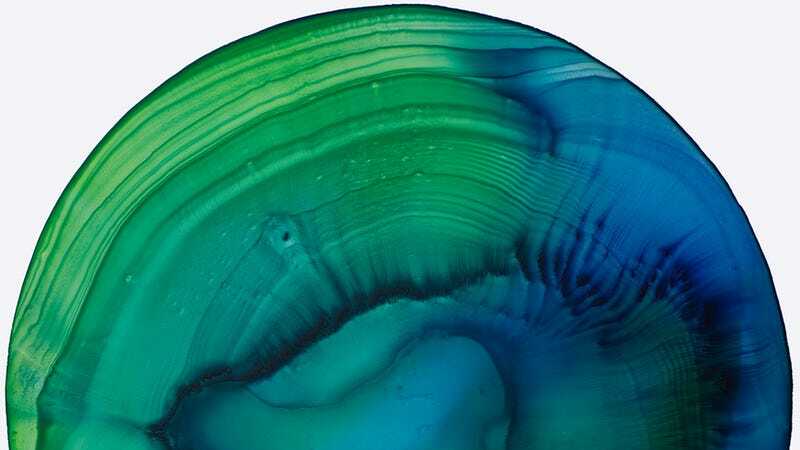 Sabraw teamed up with environmental engineer and fellow Ohio University professor Guy Riefler to turn the muck into something far more appealing—a brand new kind of pigment. Here’s how they did it: First, they pump underground water into a sealed five gallon jug, then lug it to the lab for a complete transformation. At this point, it’s still pretty clear—that is, until the scientists pour controlled amounts into vessels equipped with bubblers that aerate the samples. Then, a dark kind of “sludge” emerges by what seems to be some kind of unholy magic and sinks to the bottom; Sabraw collects this and blends it with acrylic polymers and resins to make hues that range from yellow to brown to red to black. These colored sludges are then air or heat dried—each of which affects the resulting shades—ground into powdered pigments, mixed with linseed oil, et voila! Non-toxic “toxic” paint (he assured me that the product is totally harmless). Once he’s got the goods back at his studio, Sabraw preps his canvas; a composite two-foot-by-two-foot aluminum panel that’s held steady and completely flat with a steel jig, with a perfect circle drawn on the surface. He begins pouring the now way-watered-down pigment on top super slowly. “It naturally forms this bubble held together by surface tension only,” he says. “Like a bead of rain on a freshly waxed car. When it’s low it looks like this primordial pool that morphs and shifts then like it would in nature. I’ll watch it get bigger, and bigger, and higher, and if that surface tension breaks the whole thing will burst.” Because of this, he’ll use an eye dropper towards the end to closely administer each and every drop. When that delicate balancing act is complete, Sabrow covers the whole thing to keep dust and insects out and lets the it dry, a process that can take up to six weeks while the liquid evaporates and the temporal structural “deflates.” The end results are unpredictable and the materials and process allow for all kinds of swirly, beautiful combinations—like eyeball irises by way of tie-dye, lava lamps, and hyper-chromatic ink blots all contained within a petri dish. “You just can’t tell what’s going to happen,” he says.